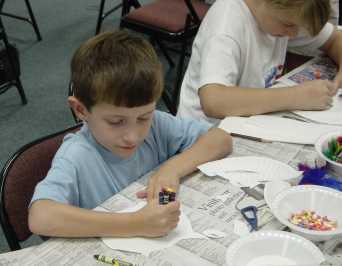 Carousel Puppets offers many different types of puppet-making workshops. For birthday parties, each child gets to make and take home a hand-puppet of their very own. Click here for samples of the birthday party puppets that the children can make. For other events, we can customize a workshop for you, based on age and number of children. We can do either a one-time workshop, or we can spread it out over several weeks. In the longer workshops, the children can also get an opportunity to perform with their latest creations and put on a show for their parents. Click here for pictures of a workshop we conducted at the Sterling Library. The children were making fairy-tale masks. or to plan your next event. Copyright © 1999-2011 Susan Wall's Carousel Puppets. All rights reserved.